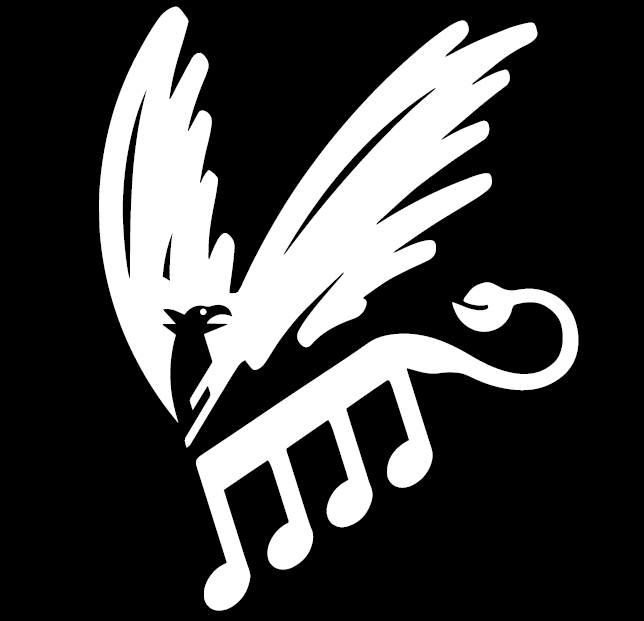 On the 15th of December 2018, VU-choir performed together with the VU-Chamber Orchestra at the Vrijburg church in Amsterdam. The concert included Choral Variation by Stravinsky on Bach’s Christmas carol “Vom Himmel Hoch da Komm’ ich Her” and symphony no. 3 by Schumann, both conducted by Harry Vorselen. The main piece was Stravinsky’s Mass, conducted by Annemiek van de Ven. This is a fairly modern piece, which made it a challenge for our choir. But after much rehearsing it ended up to be a beautiful performance! In the summer of 2018, we performed the Petite Messe Solennelle of Rossini twice. 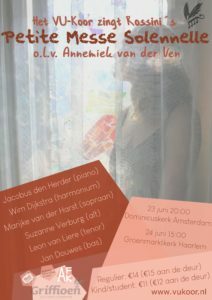 The concert on the 23rd of June took place in the Dominicuskerk in Amsterdam and the concert on the 24th of June in the Groenmarktkerk in Haarlem. The concert was conducted by Annemiek van der Ven and we worked together with four vocal soloists from Cappella Amsterdam. Instrumental accompaniment was done by Jacobus den Herder on piano and by Wim Dijkstra on harmonium. On the 7th of April 2018 the VU-choir participated in Klassifest. 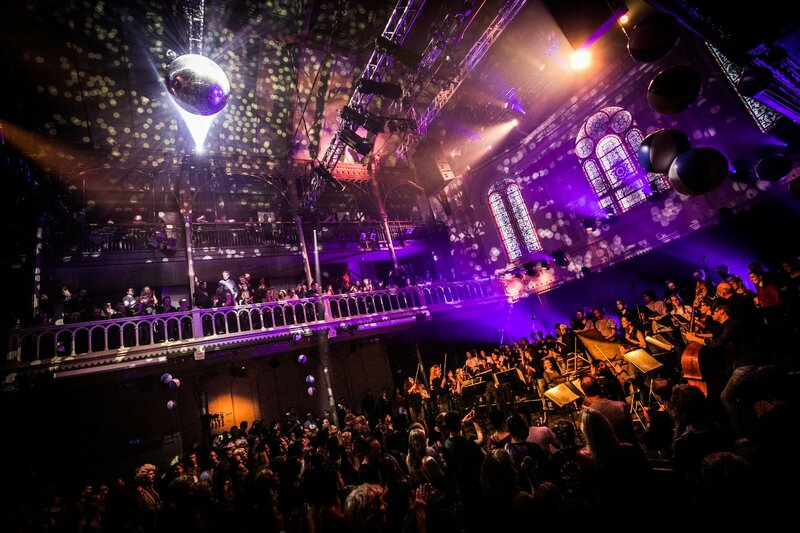 Klassifest is an annual festival in the different halls of Paradiso where you can get acquainted with classical music in an approachable way. This event hosted famous Dutch orchestras and ensembles, like the Philharmonisch Orkest and the Nederlands Blazers Ensemble. 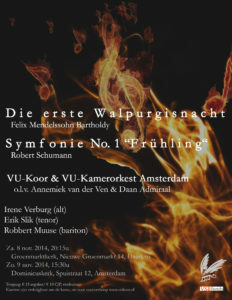 The VU-choir was asked to join the performance of Amsterdam Sinfonietta, one of the best string orchestras in the present era. We sang the Miserere of Zelenka and Dona Nobis Pacem from the Haydn’s Nelson Mass during Klassifest. A great experience we will never forget. In the early 2018, we had two beautiful concerts on the 23rd of February in the Zuiderkerk in Amsterdam and on the 24th of february in the Geertekerk in Utrecht. These concerts starred the premiere of Bell Moods, that was specifically written for our 60th anniversary by carillon player Boudewijn Zwart. We also sang the Nelson Mass by Haydn and Esenvalds Stars. The concert was conducted by Takashi Mizumoto and was in collaboration with the UvA-orchestra J.Pzn. Sweelinck. 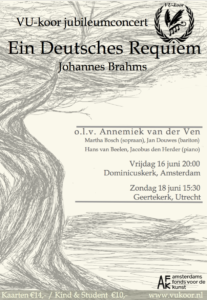 The VU-choir performed Ein Deutsches Requiem van Brahms on the 16th of June in the Dominicuskerk in Amsterdam and on the 18th June accompanied by piano. Dream of Gerontius by Edward Elgar. 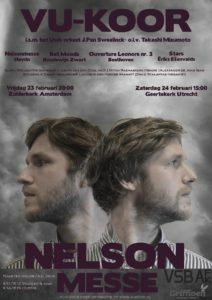 Performed in collaboration with Collegium Musicum in the Elandstraatkerk in The Hague. 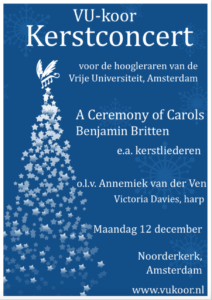 Ceremony of carols by Britten and christmas carols performed in the Boomkerk in Amsterdam and for professors of the VU in the Noorderkerk in Amsterdam. 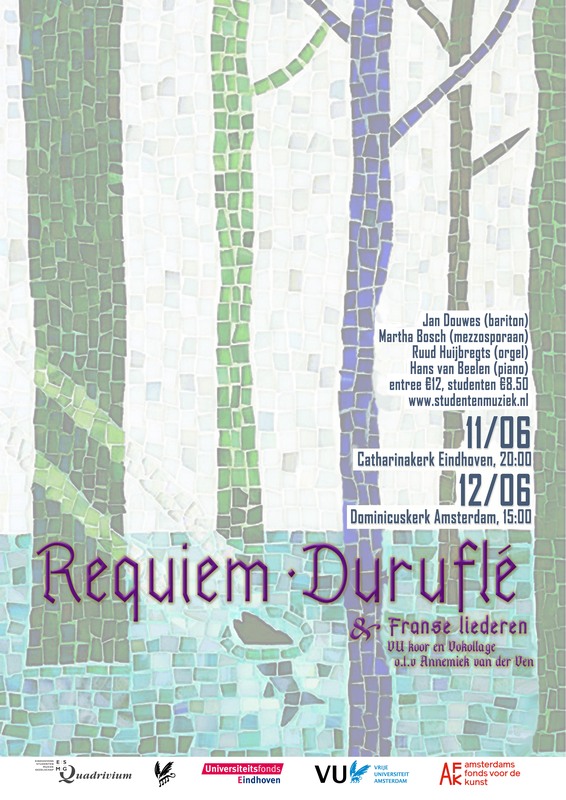 Requiem by Duruflé with organ accompaniment and in collaboration with student choir Vokollage from Eindhoven. Second part existed of, among others, pieces of Fauré, Duruflé and Saint Saens. At the festival Muziek at the Dommel The VU-choir collaborated with student choir Vokollage from Eindhoven and performed a short repertoire of French songs. The pieces where, among others, by Fauré, Duruflé and Saint Saens. 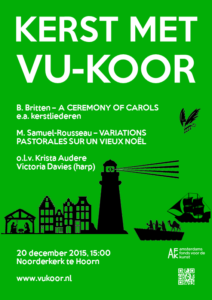 concert for staff members of the VU in collaboration with other VU-music societies. The repertoire existed of French pieces of, among others, Fauré, Duruflé and Saint Saëns. Part of the VU-choir also performed part of the christmas program at the christmas diner new professors of the VU. 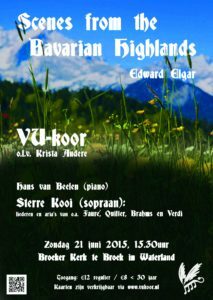 Scenes from the Bavarian Highlands by Edward Elgar in Broeker Kerk te Broek in Waterland, accompanied by Krista Audere. 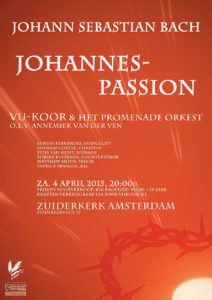 Johannes Passion by J.S. 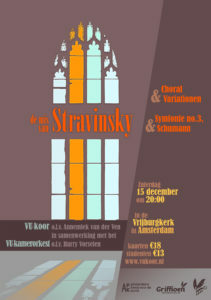 Bach in Zuiderkerk in collaboration with Promenade-orkest.